The fees on this page are for teams in the U.S. and Canada. Fees outside the U.S. and Canada are set by our regional Partners and may vary. If you are from outside the U.S. and Canada, please visit our Global Website www.firstlegoleaguejr.org to connect with your regional Partner. What does the registration fee get my team? 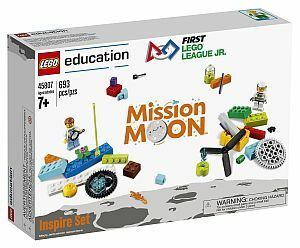 Inspire Set - This LEGO® set is created just for FIRST LEGO League Jr. teams and will be used by them to complete their challenge for the season. The Inspire Set includes 700+ LEGO elements, including those needed to create the exclusive Inspire Model. Challenge Document - This one page document quickly outlines the yearly challenge. This can be accessed online by everyone, regardless of which option you choose. Team Meeting Guide - This is a guide for coaches that gives complete instructions on how to administer the FIRST LEGO League Jr. program. It outlines 12 sessions, providing 12-16 hours of guided activities for teams. Registration fee does not include shipping and handling, admission to an Expo, nor does it guarantee that there are Partner run Expos in your region. Partner may charge an additional fee to attend their Expos - those fees are set and collected by the Partner. Teams are required to use LEGO Education WeDo 2.0 in FIRST LEGO League Jr. If you need to purchase a WeDo 2.0 Set, you have the option to purchase at a discount through our team registration site after you have paid the team registration fee. Taxes will be applied as required. Team Registration - $99.00 USD - This option is for individual teams of 6 students or less. This option only includes the materials needed to run the program once with one set of students. Registration includes: 1 Inspire Set, 6 Engineering Notebooks, and 2 Team Meeting Guides. Additional LEGO products must be purchased separately. LEGO Education WeDo kits are sold separately and are needed for participation. Team registration fee does not include admission to a team expo, nor does it guarantee that there are Partner run expos in your region. Partner may charge a fee to attend their expos - those fees are set and collected locally to run the program.